Ghostbed vs Nectar Mattress Comparison - Which Bed Should You Buy? 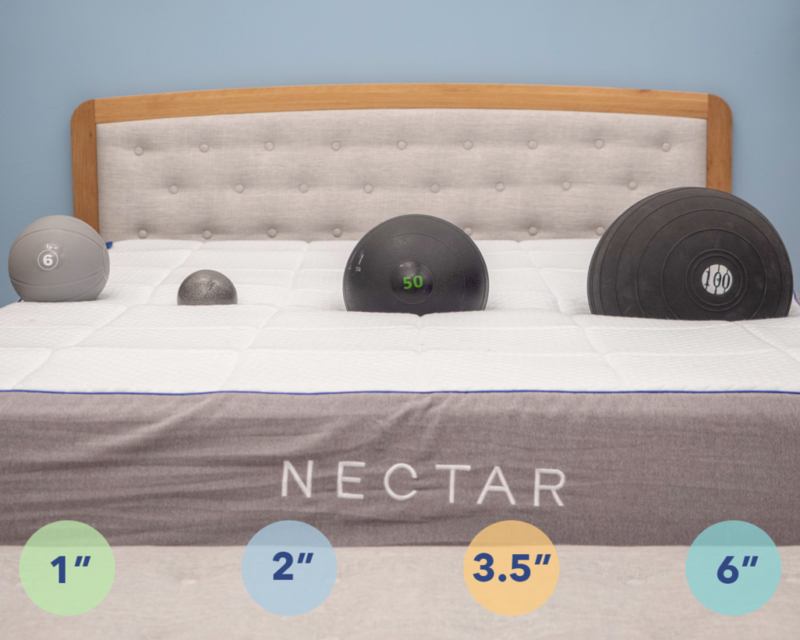 I’m extra excited about this comparison because I’ll be sizing up two of the most popular all-foam mattresses in the game: Ghostbed and Nectar. From the outset they seem super similar, but I won’t really know what’s cooking until I peel back the covers and dive into their respective layers. And while I’m rolling up my sleeves to figure out what makes these mattresses unique, I’ll also be helping you decide which one is 100% the right bed for you. So… will it be the irresistibly plush Nectar or the lively Ghostbed? Only time — and this comparison! — will tell. Click here to skip to the review summary if you don’t have time to read the whole thing! Take $100 off your entire Ghostbed order with our exclusive discount! Use code SLEEPOPOLIS125 for $125 off any Nectar mattress! Before we dissect all the nitty gritty details that contribute to these beds’ unique vibes, let’s take a second to chat about a few of their similarities. All-Foam Construction – As I mentioned up top, both the Ghostbed and Nectar are built entirely of foam. 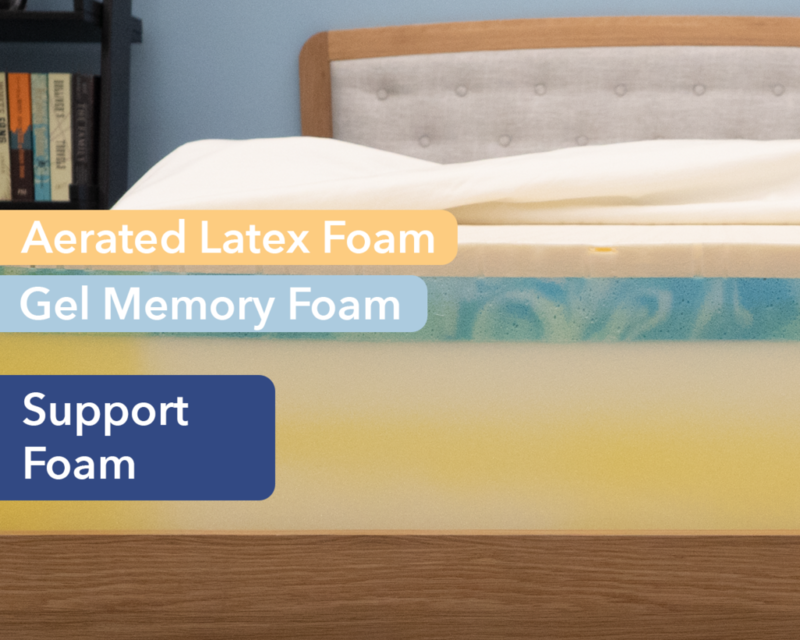 While this may lead some to think they’d have identical feels, the different foams they employ (thick sections of memory foam for the Nectar and a more balanced latex + memory foam approach for the Ghostbed) result in distinct sleeping experiences. Pressure Relief – Though they achieve it in different ways, I’d say a hallmark of these mattresses is their fantastic pressure relief. While the Ghostbed is slightly more supportive and the Nectar is slightly more gentle, both are designed to alleviate tension at sensitive spots along the body. Now that we’ve got all that sorted, let’s get into the good stuff i.e. what magic’s brewing right underneath the covers. Throughout this section, I’ll pinpoint the specific features that make the beds feel like they do, all while directly comparing these specs to one another. You’ll get a general low down of each bed’s build, but I’d also encourage you to check out our full reviews of the Nectar and Ghostbed. Cover – The cover is comprised of both cotton and Tencel, an eco-friendly material known for its softness and breathability. There’s also an inch of gel memory foam quilted here, which provide the sleeper with some nice comfort. The combo of Tencel fibers with the gel infusion makes for a cooling layer that’ll help regulate temperatures throughout the mattress. 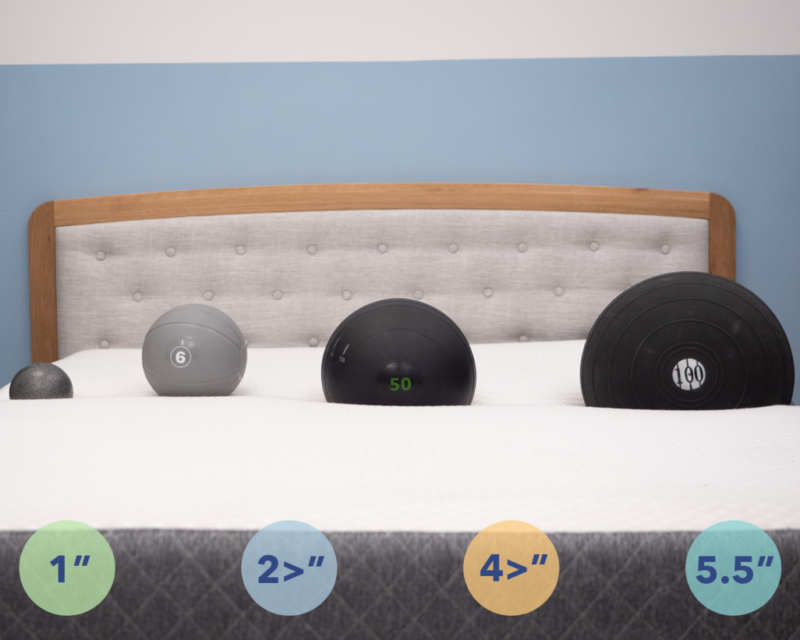 Comfort Layer – Next up, you’ll encounter 3” of memory foam. While a lot of beds use memory foam in their comfort layers, very few implement such a thick layer of the stuff, which makes the three inches here pretty unique to Nectar. The result is an immense amount of body contouring that’ll likely leave you feeling more “in” the bed than “on top” of it. Though not ideal for all sleepers, it could be a great fit for those who doze primarily on their sides. Transition Layer – Directly below this memory foam layer, you’ll find… yet another section of memory foam, albeit a slightly firmer one. This layer is meant to transition the sleeper into the firm base below, helping to extend the contouring of the comfort layer even deeper into the mattress. Foundation Layer – Rounding out the construction, we’ve got 6” of high-density poly foam. This section gives the bed its stability and shape, providing a solid foundation upon which the softer foams can react. Cover – The cover is made up of a combo of viscose and polyester, which creates a stretchy material that won’t bunch up as you move around. It’s also quite thin, so should encourage some nice airflow throughout the bed. 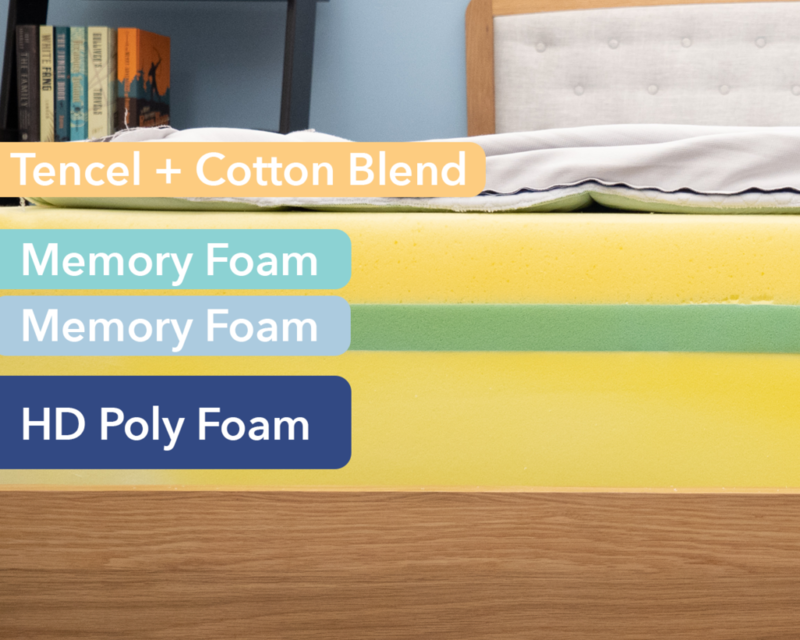 Comfort Layer – Comprised of 1.5” of latex foam, the comfort layer of this mattress has a quick response to pressure, which should help keep the sleeper positioned on top of the structure and prevent any sort of stuck-in-the-bed feeling. Right off the bat, we can see how the use of latex here (as opposed to memory foam in the Nectar) produces a totally different feel, allowing for optimized mobility. 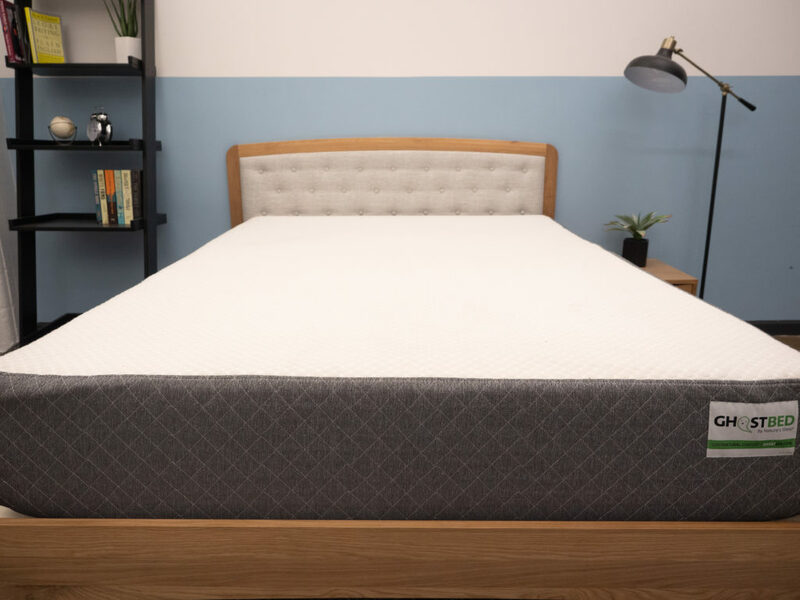 Compression Layer – Up next, you’ll find 2” of gel memory foam, which functions as a sort of compression layer in the mattress for some satisfying pressure relief. While you’re not going to experience the same deep body contouring here as you would on the Nectar, you’ll still get a decent amount of sinkage. 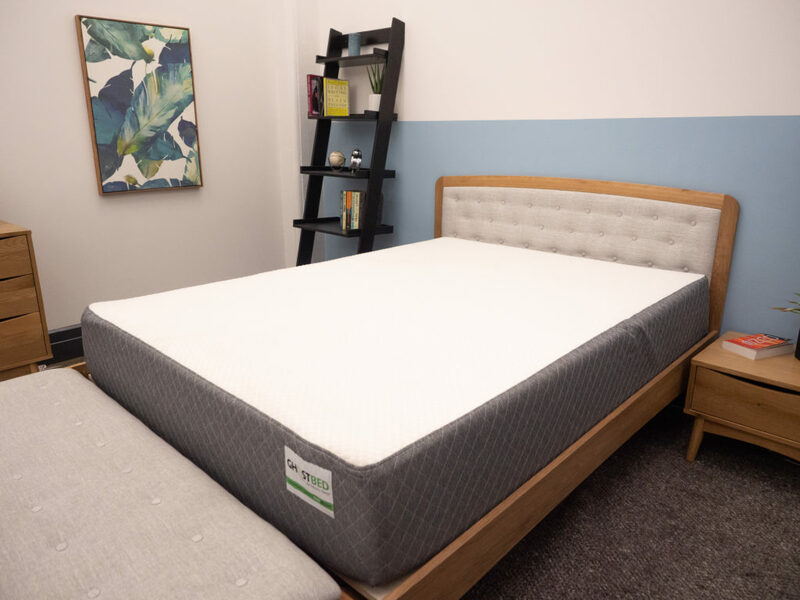 Base Layer – The foundation of the mattress consists of 7.5” of high-density poly foam, working mainly to provide support to the mattress as well as some durability. You’ll notice this section is quite a bit taller than the Nectar’s, which contributes to the Ghostbed’s overall firmer vibe. It doesn’t take a trained eye to see there are several differences between the Nectar and Ghostbed. While my nerdy little mattress-loving heart could dive into a myriad of these, I figured it’d be helpful to break down the most striking ones. Comfort – Here, the tone of each mattress is defined by its respective comfort layer. 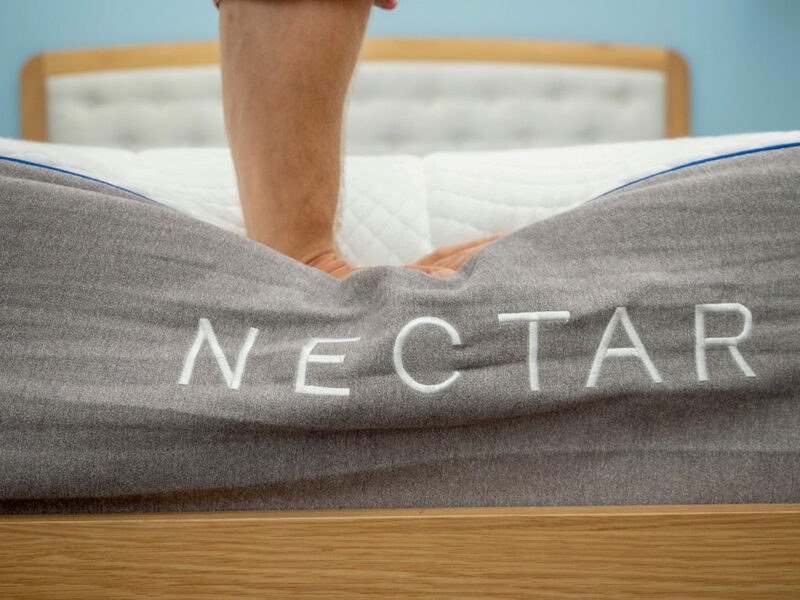 A thick section of memory foam in the Nectar results in a gentle, pressure-relieving structure that’s chock-full of body contouring and sinkage. 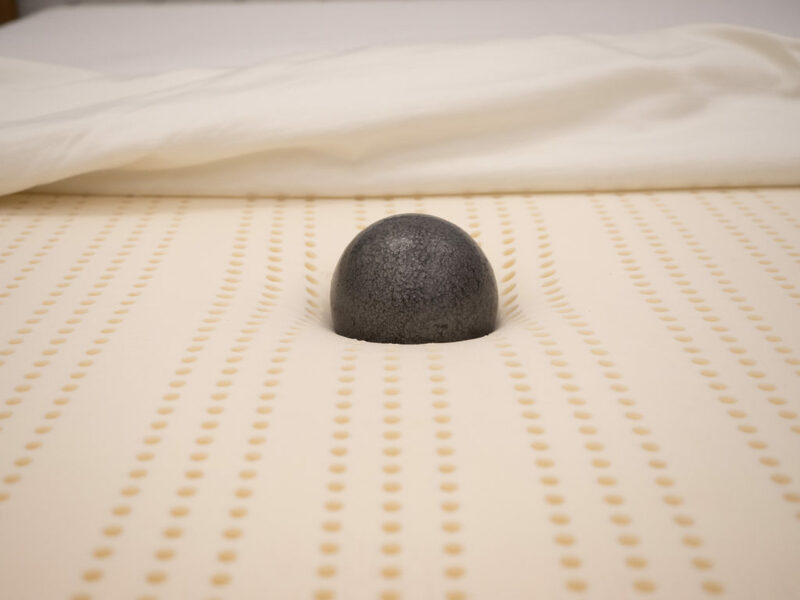 Conversely, a latex layer stacked atop a thinner slice of memory foam in the Ghostbed produces a more balanced feel that works to keep the sleeper lifted on top of the bed. While side sleepers might be drawn to the former’s softness, combo sleepers are likely to enjoy moving around on the surface of the latter. Support – These two mattresses also tackle support in pretty divergent ways. Where the Nectar puts the focus on pressure relief (truly only supplying support in the high-density poly foam base), the Ghostbed takes a more all-encompassing approach, hedging its bets across both pressure relief AND support with its bouncy top layer of latex. Cooling – As a final thought, I think it’s also important to point out that the Ghostbed is likely to sleep cooler than the Nectar. 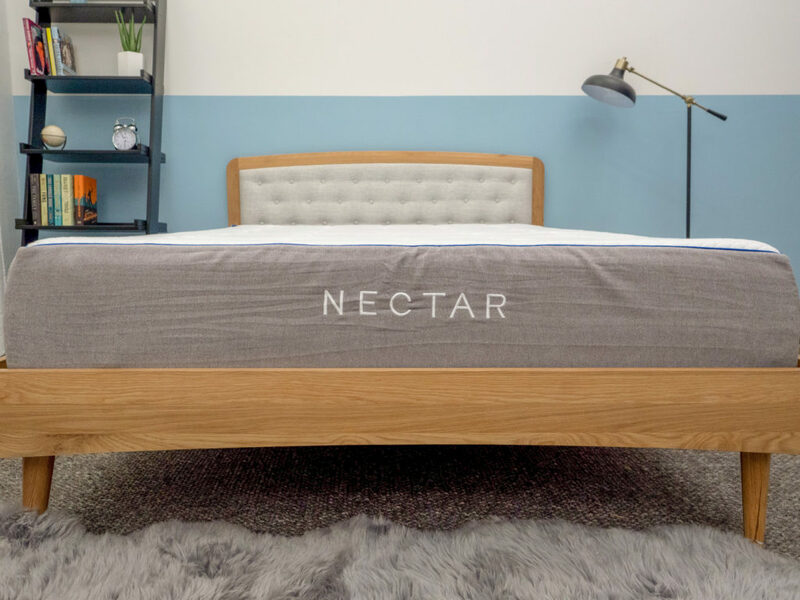 While both beds feature memory foam (a material notorious for its overheating properties), the Ghostbed does more work to mitigate this than the Nectar. And how? With its gel infusion and inclusion of naturally cooling latex near the surface of the bed. Construction specs aside, let’s get into how these mattresses feel. While feel is always going to be a personal thing, I’ll try my darndest to demonstrate how these beds’ unique characteristics contribute to their distinct vibes. Since everyone feels the firmness of a mattress differently (because of size and weight distribution), I decided to bring in three more testers to try out each of these beds. Below is the graph showing the average firmness rating for each of the mattresses. 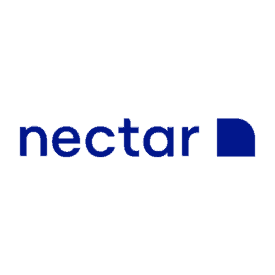 Though my testers and I were in a bit of disagreement, we ended up giving the Nectar an average firmness rating of 6.5, which syncs up perfectly with the industry standard for medium firmness. I personally gave the Nectar a 6 as I found its thick memory foam layers produced a gentle, pressure-relieving vibe. No matter the position I stretched out in, I could feel the material contouring to the curves of my body for some pretty intense sinkage. This resulted in a softer rating from me, but I’ve heard back from some of my readers that the memory foam actually produced a firmer feel as their bodies slowly acclimated to its morphing shape. That’s why I always suggest resting on a memory foam bed for a few minutes before deciding on its firmness. Regardless, the contouring feel is going to work best for side sleepers, who will likely find a lot to love in the cushiony pressure relief they’ll experience at the shoulders and hips. Stomach sleepers, on the other hand, may find the overall lack of support to be detrimental to their comfort as their hips sink out of alignment with their shoulders. 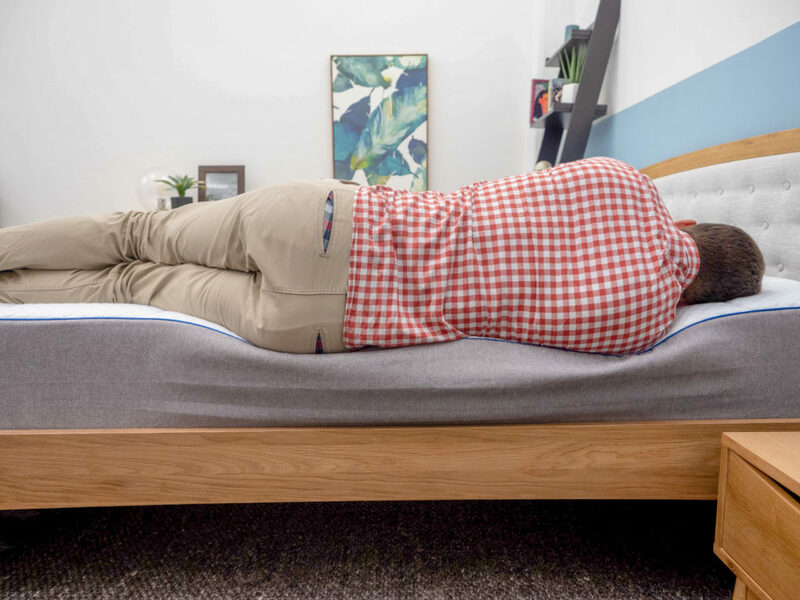 I’d also say the “stuck” feeling you’ll likely experience with the memory foam makes it difficult to move around and change positions, which could be a no-go for combo sleepers. Interestingly enough, my testers also gave the Ghostbed an average firmness rating of 6.5. While this is technically the same score they gave the Nectar, I don’t think it fully takes into account their different feels. In fact, I’d say when juxtaposed against one another, the Nectar is truly more of a 6 and the Ghostbed is closer to a 7. That being said, I gave the Ghostbed a 6.5 as I found it combination of memory foam and latex to create a true medium firm feel. The balance between pressure relief and support is struck soundly here, so you’re likely to get some cozy sinkage without feeling too stuck in the mattress. As I moved around the bed, I experienced a lot of comfort, which tells me it could be a great fit for combo sleepers. In terms of specific positions, I felt pretty equally supported on my back, stomach, and side. However, since this bed is truly just a shade over medium firm, it may not be firm enough for strict stomach sleepers or heavier individuals. 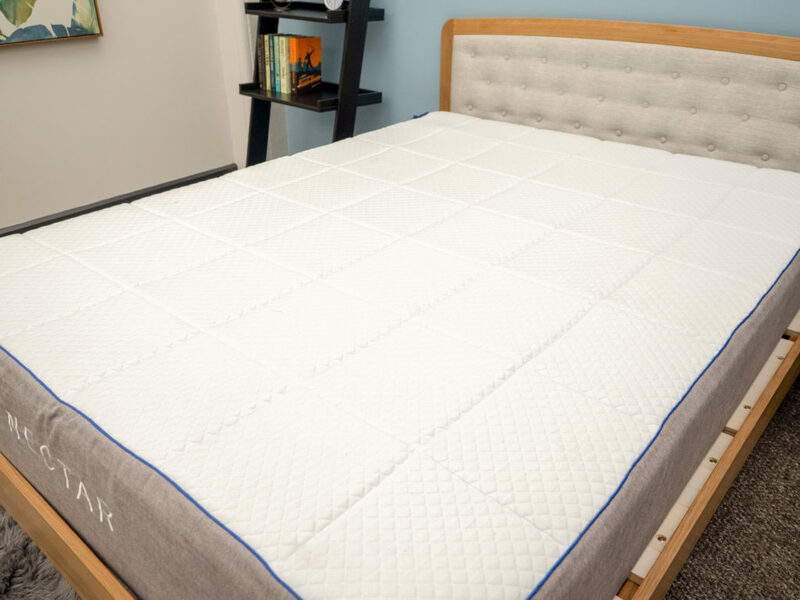 Like the original, the Luxe is built with three layers of foam, though it flips a latex top layer for one of gel-infused memory foam. While the switch is subtle, it makes for a big difference as it produces a more gentle, luxurious vibe (with a more expensive price tag to boot). In this way, the Luxe is actually quite similar to the Nectar in that it provides fantastic pressure relief and sinkage. I’d also say the Luxe sleeps cooler than the original Ghostbed. Though both are great at regulating body temperature, the Luxe gets a bit of a plus not only from the gel infusion in the top layer, but also from a special phase change material woven into the cover. This makes for a cool-to-the-touch feel that could be especially great for sleepers who tend to overheat at night. For more, read my full comparison of the Ghostbed vs. Ghostbed Luxe. Next up: sinkage, or the amount you’re likely to sink into the bed while lying on top of it. To visualize this characteristic, I’ve placed balls of different sizes and weights (a 6 lb medicine ball, a 10 lb steel ball, a 50 lb medicine ball and a 100 lb medicine ball) on the surface of each mattress and measured how far into the structure they sank. To be honest, I’m slightly surprised by how similar these sinkage results are! As I stretched out on both mattresses, I assumed the Nectar would take a clear lead here, but it actually has almost the same amount of sinkage as the Ghostbed. However, I’d still say you’re more likely to feel positioned “on top” of the Ghostbed and “in” the Nectar. And finally, let’s wrap up this section with a little motion transfer, which refers to the amount of disturbance you’re likely to experience from one side of the bed to the other. While this test will be important for all sleepers, it’ll be especially pertinent for those of you who plan to share your bed with a partner and need to know if their tossing and turning in the night is going to drive you up the wall. To illustrate this motion transfer, I dropped a 10 lb. steel ball from heights of 4 inches, 8 inches and 12 inches and measured the disturbance it caused. Both beds did fairly well on the test, though I’d give a slight advantage to the Nectar, whose thick layers of memory foam up top really work to dampen motion across the structure. All in all, you shouldn’t be too disturbed by your partner’s movements on either one of these mattresses. After going over both of these beds with a fine tooth comb, I think there are a few big takeaways to keep in mind. First and foremost, each mattress’ comfort layer sets the tone for its overall vibe. While the Nectar’s thick top sections of memory foam produce plentiful body contouring and sinkage throughout the structure, the Ghostbed’s latex makes for a livelier bed with a sprightly lift. This, in turn, makes it a better mattress for combo sleepers, who should be able to move around and change positions with ease. 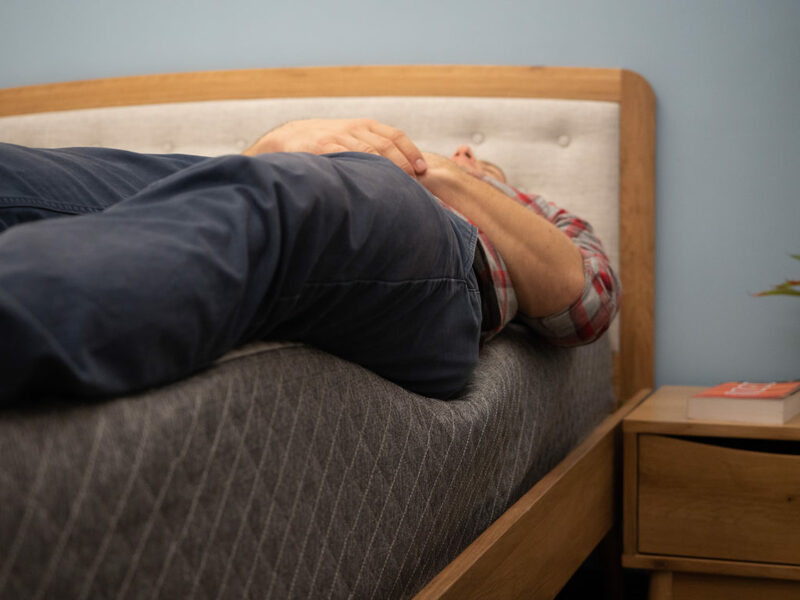 Side sleepers, on the other hand, will likely navigate toward the Nectar, whose cushiony memory foam will provide targeted pressure relief to the shoulders and hips. While the feels are clearly different, the beds actually have very similar price points, with a queen size Nectar coming in at $699 compared to the Ghostbed’s $795. The first thing to figure out is what kind of sleeper you are. Are you a side sleeper? Go Nectar. Combo sleeper? 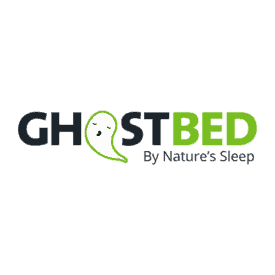 Consider checking out the Ghostbed. The second comes down to sinkage. If you want to feel like you’re sleeping “in” your bed, I’d suggest the Nectar. However, if you enjoy being positioned more “on top” of your mattress, I’d say the Ghostbed is for you. And finally, let’s talk value! Below, I’ve broken down the prices for all the different sizes of both mattresses. To get even more specific about my recommendations, I’m going to list the great aspects of both models. This bed could be a real winner for anyone after that classic memory foam feel, complete with deep body contouring and sinkage. For this reason, I’d also say it’s a solid pick for side sleepers as the plush top layers will provide pressure relief to the shoulders and hips. 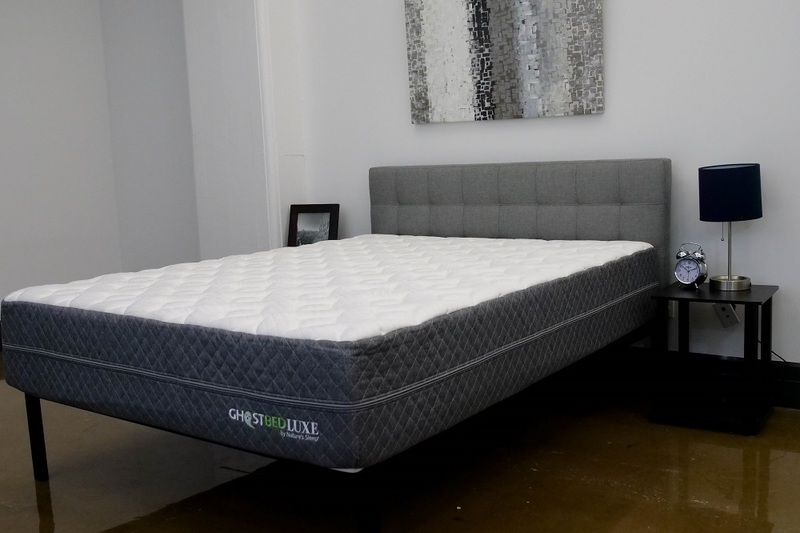 With its more buoyant top layer of latex foam, the Ghostbed is particularly well-suited for combo sleepers. Additionally, it also sleeps cool thanks to the combination of naturally cooling latex and gel-infused memory foam. Well that does it for this Nectar vs. Ghostbed comparison! If you have any more questions or comments, please feel free to leave a message on the video.